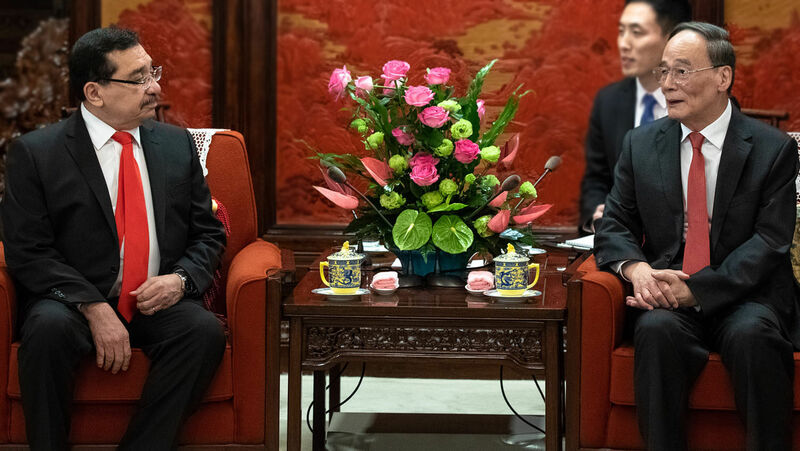 Chinese Vice President Wang Qishan (right) and Medardo Gonzalez, secretary general of the ruling party of El Salvador, meet at the Zhongnanhai Leadership Compound in Beijing on August 21. Many are questioning how long Taiwan will be able to remain sovereign. El Salvador cut ties with Taiwan on August 20 to establish a formal alliance with China, becoming the fifth nation in two years to switch its allegiance. “We are convinced this is a step in the right direction that corresponds to the principles of international law, of international relations and the inevitable trends of our time,” El Salvador’s president, Salvador Sánchez Cerén, said in a nationally televised speech. El Salvador will see “great benefits” and “extraordinary opportunities” in the new relationship with China, he said. El Salvador’s decision came after it had unsuccessfully petitioned Taiwan for development funds to revive a deserted harbor. After Taiwan declined, saying the project was economically unsustainable due to scant maritime traffic, China stepped in and agreed to provide funding, as long as El Salvador would switch its allegiance from Taiwan to China. China’s timetable for reviving and possibly militarizing the Salvadoran harbor is currently unknown. What is clear is that Taiwan has lost another ally. In 2016, São Tomé and Príncipe ended relations with Taiwan in favor of ties with China. Last year, Panama followed suit. And in May, both the Dominican Republic and Burkina Faso announced that they were also switching allegiances. China views Taiwan as a rogue province that belongs under the control of the Communist Party along with the mainland. It has said it is willing to use force, if necessary, to bring the island under its control. Each time a nation breaks diplomatic ties with Taiwan, it is stating that it agrees with China that Taiwan is not sovereign and independent. With El Salvador’s defection, Taiwan is now left with only 17 formal diplomatic allies around the globe, most of them small, less-developed countries. Taiwanese President Tsai Ing-wen said the defection of El Salvador and other nations is due to an intensifying Chinese effort. The effort has also included an increasing number of Chinese military drills and bomber patrols near the island and an Orwellian demand that the very name “Taiwan” be blotted out of existence on websites for airlines based as far away as the United States. Taiwanese Foreign Minister Joseph Wu said China’s intensifying efforts to isolate and take over Taiwan will backfire. “Pressure from China would only make Taiwan more determined to continue our path of democracy and freedom,” he said. But a shift underway in the global power balance shows that Taiwan’s being “more determined” will not be enough to keep it free for much longer. For decades, the Taiwanese people have lived in fear of military invasion from China. But they have managed to stay independent due to military equipment, political support and security assurances from their main ally, the United States. In recent decades, however, U.S. support for Taiwanese independence has faded. In 1998, Bill Clinton became the first American president to publicly oppose Taiwanese independence. Trumpet editor in chief Gerald Flurry said at the time that Clinton’s remarks demonstrated that it was only a matter of time until Taiwan would be forced under China’s rule. “The Chinese leaders pressured the president and America to speak against our freedom-loving friends [in Taiwan],” Mr. Flurry wrote in the August 1998 Trumpet issue. The people of Taiwan fear for their future. They feel betrayed. … Once again, America has showcased its broken will to the whole world. … How could anyone fail to see that Taiwan is destined to become a part of mainland China? These 21 million people are going to be forced into the Chinese mold; and it is going to happen for one reason: because of a pitifully weak-willed America. Does freedom really mean so little to us? Mr. Flurry’s understanding of America’s broken will and the China-Taiwan dynamic is based on Bible prophecies recorded in the books of Leviticus, Daniel and elsewhere. When he wrote that 1998 article, the likelihood of Taiwan being assimilated into China seemed remote. But today, with China gaining economic and military strength, growing more belligerent on the Taiwan issue, and buying off Taiwan’s allies one by one—and with the U.S. failing to stand up to it—Mr. Flurry’s forecast will soon come to pass. To understand the significance of the rise of China in the context of Bible prophecy, order a free copy of our booklet Russia and China in Prophecy.